There is that commonly asked question: What’s the best wine you’ve ever drunk? Not easy to answer when you’ve been blessed with so much legendary fermented grape juice over the years. Singling out one is impossible, though I could probably whittle a list down to a top ten. Certainly, if I break down that list per region, my Burgundy must include the 1971 Clos de la Roche Vieilles Vignes from Domaine Ponsot. It was actually a back-up bottle generously donated during a memorable dinner at the 1243 Club, organised by a Dutch friend, that included no less than the 1978 Romanée-Conti. It would be too strong to say that the Clos de la Roche wiped the floor with the Romanée-Conti; however, there was one clear winner in my book. Jean-Marie Ponsot, father of Laurent, made the 1971. Born in 1927, Jean-Marie commenced working alongside his father Hippolyte in 1947, taking over completely ten years later. Domaine Ponsot’s holdings in Clos de la Roche originate from 0.5 hectares bought in 1925 by Hippolyte and his uncle William Ponsot, augmented by another hectare in 1952. Subsequent expansion meant that Ponsot became the largest landowner in Clos de la Roche, at 3.31 hectares, though I believe the 1971 would have come from the original 1.5 hectares. Ponsot was one of the leading researchers into clonal material, together with Bernard Clair at the University of Dijon. As Clive Coates MW points out in his Côte d’Or tome, many of Burgundy’s finest clones actually originate from this domaine. 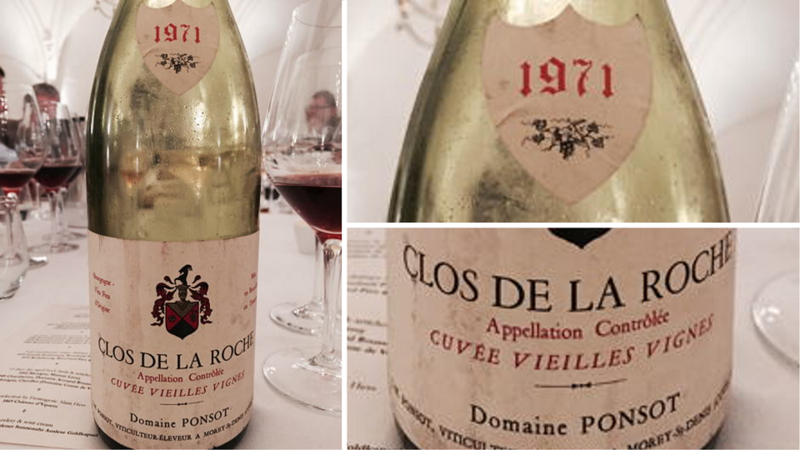 Therefore, it is safe to say that Ponsot’s vines would have been in healthy condition in the early 1970s, which partly underpins this extraordinary wine. The 1971 Clos de la Roche Vieilles Vignes Grand Cru is youthful considering its age, with just a thin tawny rim. The bouquet is an otherworldly mélange of freshly sliced strawberry, kirsch, crushed stone and rose petals, all delivered with transfixing delineation and focus. Over the course of an hour, it seems to gain complexity and intensity. The palate manages to fulfill the promise of the nose. Seemingly as vivacious as the day it was born, it balances a fine bead of acidity with hints of blood orange and maraschino, fanning out towards the finish with not so much hubris as effortless ease. It is a crystalline wonder. From whatever perspective you examine this Clos de la Roche, at least on the basis of this solitary encounter, I can only conclude that it is a perfect wine. 100/Drink 2019-2030.